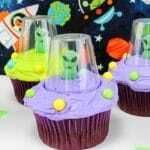 These alien cupcakes are super easy to make but will delight kids as much (perhaps more than) fancy cupcakes from a bakery. You won’t need any fancy equipment or a degree in cake decorating either! When people ask me what I blog about, I usually say I like to help moms who love Pinterest but don’t have the time or energy to recreate most of what they see there. I’m all about fast, easy projects and recipes. I’d rather you spend time enjoying treats with your kids than making them. There’s no reason to spend hours slaving away to create something fun and appealing when you can get the same result in a fraction of the time. Also, I’m not domestically talented. I don’t have a culinary degree, amazing craft talents, or the desire to acquire such skills. I DO like to have fun. I do like to make my kids smile. And if I’m being totally honest, I do love when I pull off something that looks hard but wasn’t. 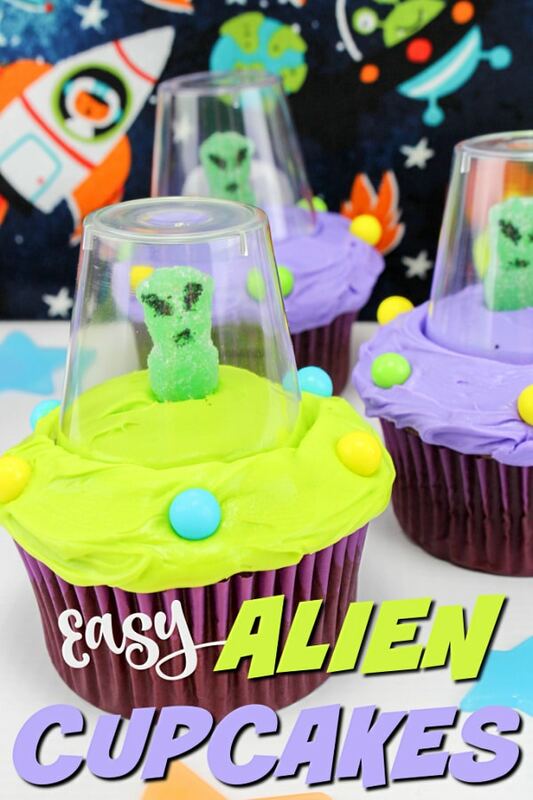 These alien cupcakes fall into that category. 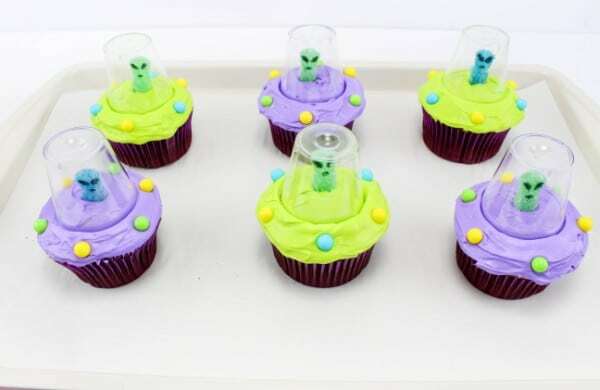 Since another thing I try to avoid is wasting money, here are some other ways to get use out of the extra items you’ll have left over from above after making your alien cupcakes. I don’t use food coloring very often so when I find myself with almost full bottles in the pantry, I use it up in some of these interesting ways. Since those mini plastic cups come in big quantities, but I only need 12 for the cupcakes, I have a lot leftover. I like to keep them on-hand in my party supplies for individual portions of dips or desserts. If you don’t already have a food writer marker, it might seem silly to buy one now. However, you’ll be missing out on a great way to easily add fun messages to everything from toast to cookies. Plus, these markers write great on marshmallows! 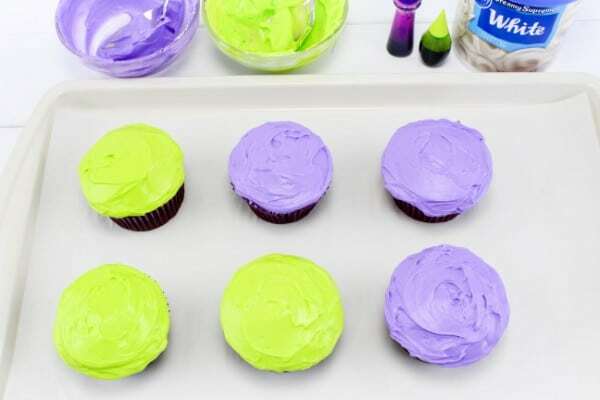 To make the cupcakes, first, you need to color the frosting. I wanted some color contrast so I did two different colors, but you can just do one if you want to save time and trouble. When your frosting is fully colored, frost your cupcakes. Now we need to make our little aliens. Using your food writer marker, draw alien eyes (and a mouth, if you want) on 6 of the Sour Patch Kids. 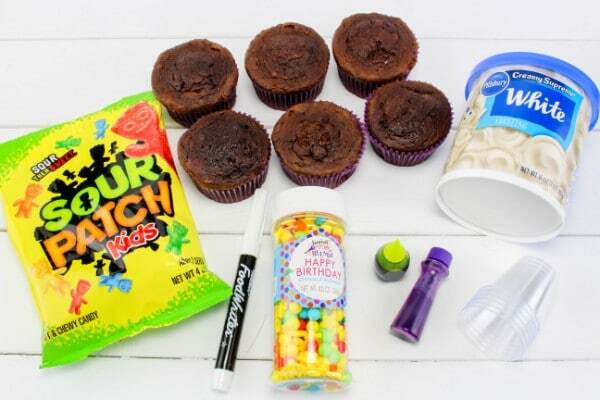 Stick one candy into the center of each cupcake. 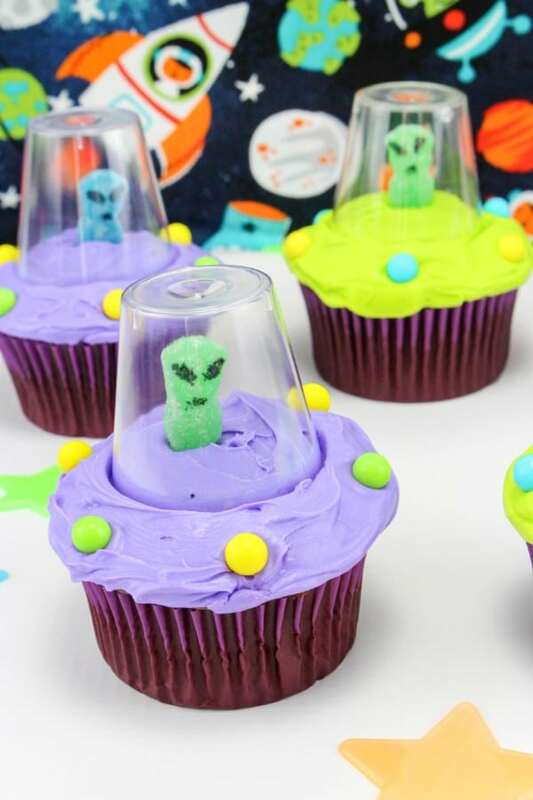 To finish up your alien cupcakes, place small colored candies around the edge of the cupcake for the UFO lights. Try to space them evenly. That’s it! 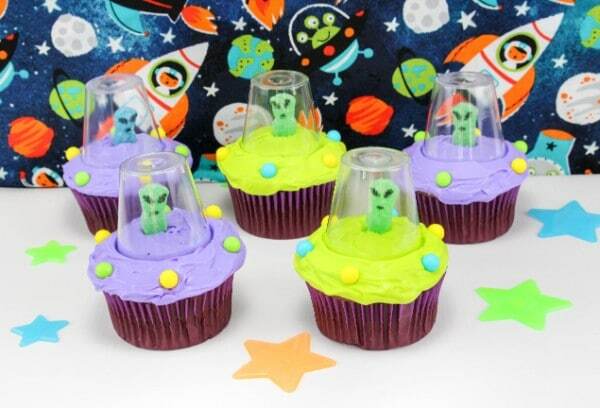 Your out-of-this-world alien cupcakes are ready to serve to your favorite outer space fans! Want to print this recipe? Just click on the “Print” button in the box below. Color part of the frosting purple and part of the frosting green. Frost 3 cupcakes each with the purple and green frosting. 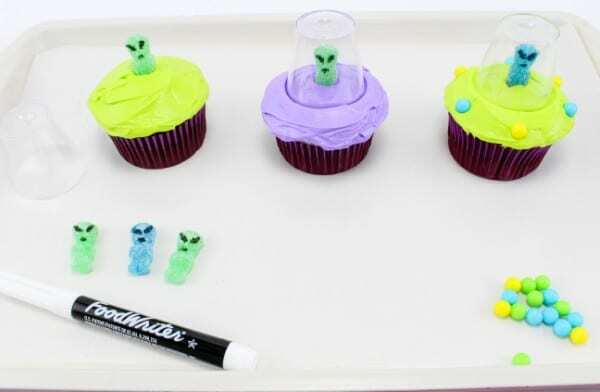 Draw 2 little alien eyes on 6 of the sour patch kids and stick one in the center of each cupcake. Press them into the frosting a little bit so they stand upright. Put a little cup over each alien and press it into the frosting just a little bit so it looks like he’s inside the top of the space ship. Put 6 of the ball sprinkles/candy in the frosting around the edge of the cupcakes. Space them apart equally so they look like the lights on the UFO’s. These are so much fun! Like you, I love simple ideas that I can really do in my busy life and still be proud of. These are perfect for my busy life.